Preheat the oven to 400 degrees. On a 9x13 baking sheet wrapped with tinfoil, toss the sprouts with the oil, evenly coating all of them. For 20 minutes, roast in the oven. You want them to cook evenly, so mix them around halfway through cooking. Remove the pan from the oven and position the rack on the top row, then set the broiler to high. Whisk together the garlic, fish or soy sauce, and Thai Chili sauce in a small bowl. 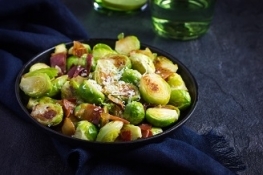 Drizzle over the brussels sprouts and mix together, making sure to evenly coat them. Broil for about 5 minutes or until the Thai Chili Sauce is lightly bubbling. Watch them to make sure they do not burn. Remove them, serve and enjoy!